UCD Ad Astra Academy is strongly committed to encouraging students with exceptional talents in academic pursuits, sports or performing arts to develop their abilities to their full potential. Through membership of the Academy, students displaying elite potential to international standards in academic pursuits, sports or performing arts are encouraged and supported to develop their talent further. The UCD Ad Astra Academy provides these students with a range of benefits, mentoring and innovative supports to allow them to achieve at the highest levels. The students in turn are expected to make a significant contribution to the Academy, the University and when they graduate, to society at large. Attention all 6th years - the CAO final closing date is this coming Monday 1st February at 17.15. Anyone who has not yet registered should do so asap. Please be aware that if you are applying to any restricted courses they also need to be down on your CAO by this date and time. Restricted courses include Medicine, Nursing, many Music, Art, Drama, Photography, Animation, Film and TV, and Visual Communication Design courses, along with Product Design in NCAD and the Level 7 Dental Hygiene and Dental Technology courses in Trinity. IADT Department of Technology and Psychology are hosting three workshops (see below) on Tuesday, 16th February during midterm at the IADT Campus in Kill Avenue, Dun Laoghaire. These workshops are aimed mainly at CAO 2016 applicants. Should places be available, 5th year students will also be welcome. In order to book a place please tell Ms. O'Connor or contact Elena Somoza directly at elena.somoza@iadt.ie no later than Thursday 11th February. 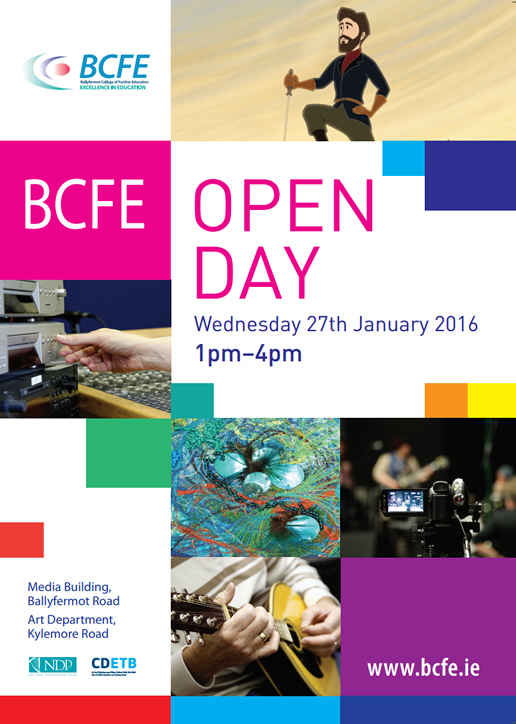 Ballyfermot College of Further Education are hosting their Open Day today Wednesday 27th January from 1pm-4pm. There are many courses available at Ballyfermot including Film and TV, Visual Communication Design, Art, Games Design, Music and probably most renowned, their Irish School of Animation courses ranging from Level 5 to Level 8. Saturday, 23rd January 2016 the School of Architecture, Planning and Environmental Policy at UCD will open its doors to students who are interested in studying Architecture or Landscape Architecture at UCD. The open day, starting at 12pm, will take place at the Richview studios in UCD, where students will have an opportunity to explore the studios and buildings as well as viewing the work of current students. Academic staff will be on hand to meet students and answer any questions you may have. 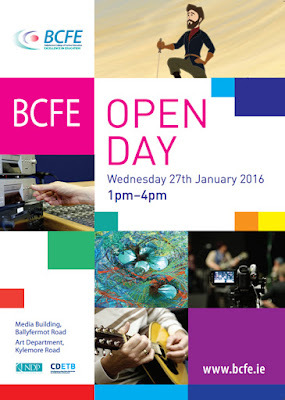 National College of Ireland's open day will take place on Saturday 23rd of January at their city-centre campus, in the heart of Dublin’s IFSC. Come along at any time between 10am to 1pm. We will be providing information on all full-time and part-time courses at this event. There will be a great student hamper up for grabs, packed with study essentials - including a Samsung Galaxy Tablet. To enter attendees should post a photo to their social network of choice, tagging us at @NCIRL and using the hashtag #NCIOpenDay2016. We're also giving away a €250 One4All voucher EVERY DAY this week with Zoo Crew on Spin1038. Tune in between 6.45pm and 8.45pm for your chance to win. TOMORROW, Wednesday 20th January is the early closing date for registration with the CAO at a cost of €25. Any 6th years who have not yet applied PLEASE do so. After 17.15 on Wed 20th Jan, and until Monday 1st Feb at 17.15, the application fee increases to €40. As the first of the CAO deadlines approaches, DIT want students to be as informed as possible if they are considering college courses in tourism, hospitality, event and leisure management. They are hosting an Online Open Day on the 14th of January between 5 - 6 p.m. to answer questions online on their progammes in hospitality, tourism, leisure and events management. Students can also ask more general questions on entry requirements, accommodation, student supports or whatever else may help in decision making. Just visit the link www.dit.ie/hospitalitymanagementtourism/livechat/ on the 14th of January and they'll take it from there! This year's UCD CAO Information Clinic is taking place on Tuesday, 12 January 2016 from 5pm until 7pm. The clinic will provide advice on the CAO application process to final year secondary school students and their families. Admission is free but pre-booking is essential. If any students are interested in attending please fill in the online booking form at www.ucd.ie/myucd/event. 5th & 6th Year students interested in studying Engineering should know the UCD Engineering Open Evening is taking place next Wednesday. Students and Parents are most welcome to attend this event which will provide attendees the opportunity to speak with lecturers, students and recent graduates to find out more about studying with us. You may also find the following documents very helpful (Engineering / Architecture & Landscape Architecture) as they provide the key information around the undergraduate programmes offered by UCD College of Engineering & Architecture. IADT Open Evening - Wednesday, 13th January from 4pm to 7pm. This open evening is mainly for 6th year students from second level schools, mature students, FETAC/PLC students, repeat Leaving Certificate students, etc that are considering applying to IADT for entry in September 2016, especially if they missed or could not attend our November Open Days. Guidance counsellors, teachers and parents are also welcome. The open evening will also offer 5th year and TY students from second level schools the opportunity to start exploring their options in IADT. The Disability Service at Trinity College Dublin are hosting a DARE and University application advice clinic for all potential students with disabilities on: Thursday 21st January 2016, at 6.00pm, Room 3074 in the Arts Building. A big welcome back to all students and best wishes to all for the new term going forward. Any 6th years who are still unsure about what they are thinking of for the CAO please make an appointment with Ms. O'Connor as soon as possible.